The Scott Jutson–designed 75′ (22.9m) maxi yacht Brindabella was built in 1993 by Boatspeed, in Australia. At one time she set the record for the fastest time for a conventionally ballasted boat in the Sydney to Hobart Yacht Race. The randomness of life sometimes redirects one’s career—sometimes out of necessity, occasionally out of choice. For yacht designer Scott Jutson, the switch from specializing in high-performance sailboats to power catamarans was a bit of both. 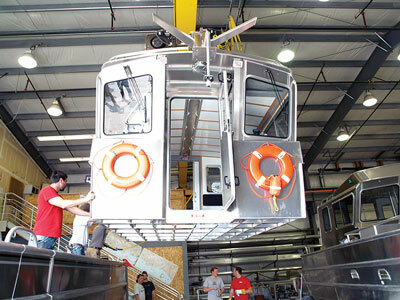 He found a lucrative market for his power catamaran designs—recreational and commercial—and found the new challenges stimulating. Today, it’s his main business. First, some background. Jutson was born in Texas, and studied yacht design at The Landing School, in Arundel, Maine, graduating in 1985. “My final project,” he writes, “was the Australian 18′ [5.5m] skiff Colorbond21, which was built in Boston by rowing-shell manufacturer Composite Engineering. It was controversial for the school as our graduation project design was required to have an engine installation. The boat is now part of the permanent collection of the Australian Maritime Museum.” To earn that distinction Colorbond21 placed second in the 1986 World Championships. So how did the boat end up in Australia? Jutson was working as a maxi boat crew in the early ’80s, married a Kiwi he met in Antigua, and lived in Sydney from 1985 onward. The 50′ (15.2m) True Blue was built with western red cedar as a core for Kevlar skins; she placed first in Class 2 in the 1994–95 BOC Challenge. In Sydney, Jutson’s emerging practice focused mostly on racing monohulls, emphasizing “solid well-engineered platforms that always had uniquely long, competitive life spans.” A good example is Brindabella, a 75′ (22.9m) yacht built in 1993 by Boatspeed, in Australia. Jutson says, “As the first IMS maxi she was not allowed to use carbon, so she is all Kevlar. Once she was launched, the rule was changed by the ITC [the Ocean Racing Council’s International Technical Committee] to allow all carbon.” SP Systems (since bought and absorbed by Gurit) engineered most of the boat, while Jutson did the keel, rudder, and mast. 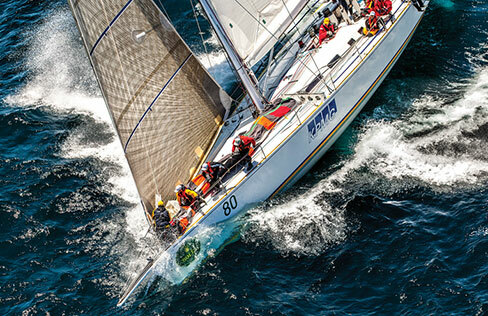 The owner successfully campaigned her for 14 years, competing in all the major east coast Australian events, recording the fastest time in the famous Sydney to Hobart Yacht Race for a conventionally ballasted boat, covering the 628-nm course in one day, 20 hours. 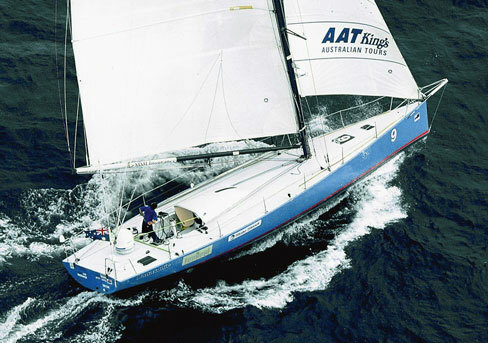 Jutson followed Brindabella with True Blue, which Aussie David Adams sailed to victory in the 40′ to 50′ (12.1m to 15.2m) class of the BOC Challenge singlehanded around-the-world race in 1994–95. Two things are interesting about this boat: first, due to budgetary limitations, True Blue was built with western red cedar as a core material for Kevlar composite skins, and the keel was mild steel. Second, Jutson ignored the prevailing thinking that the “wide skiff style” was the only way to win. Such extremely shallow, flat-bottom boats excel off the wind, but suffer upwind. Rather, Jutson “applied rigorous VPP [velocity prediction program] analysis using a global wind model” to gain an advantage in the light air of the equatorial Atlantic Ocean, willing to give up some speed and time on the Southern Ocean sleigh ride. It worked, and Adams finished 10 days ahead of the then class record. Built in 2007, the M2 60 is a 60′ (18.3m) high-performance luxury yacht that Jutson says has engines 25% smaller than the same class monohull and burns about 30% less fuel at 40 knots. Jutson designed cruising sailboats as well, and then began moving into powerboats. Jutson and Armstrong Marine have teamed up for a number of projects such as this 48′ (14.6m) aluminum research vessel for Coastal Carolina University. It’s equipped to collect data from a variety of sources, including a bow-mounted sonar system, and to deploy and recover deepwater weather buoys. Power is 2 x 380-hp (285-kW) Cummins diesels. 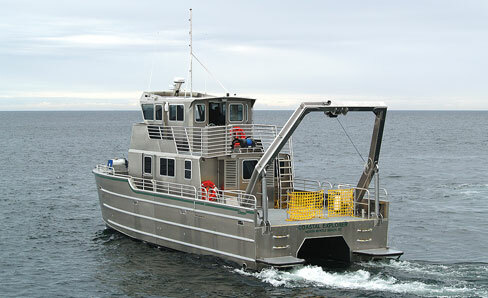 Again working with Armstrong Marine, Jutson designed this 30′ (9.1m) cat for the Kodiak Brown Bear Center, in Alaska. Due to the remote location, the boat was built in three pieces (above), airlifted to the center (top), and reassembled there. Recreational yacht builds include a 49′ (14.9m) aluminum trawler catamaran built by LeClercq Marine (Seattle, Washington); and a 35′ (10.7m) aluminum catamaran with stepped asymmetric hulls. Twin 350-hp (263-kW) Yamaha out­boards deliver speeds of 40+ knots. Service is sport fishing on the west coast of Vancouver Island. He says that the semi-displacement catamaran hullform is the near universal choice for such service; and for the next generation of crew boats he’s looking at a number of intriguing developments, such as asymmetric hulls with Hysucat foil system and variable-pitch drive systems. Finally, Jutson worked with the Kodiak Brown Bear Center, which operates a remote lakefront lodge in Alaska and needed a boat to take guests to several viewing stations on the lake. 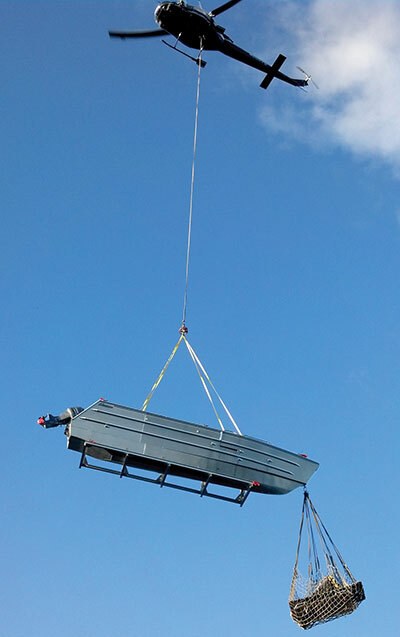 Among the considerations was how to deliver the boat. The solution was to build the 30-footer (9.1m) in three parts, fly them in by helicopter, and reassemble the boat on-site. Thanks to the accuracy of 3D software and CNC cutting at Armstrong Marine, the parts came together flawlessly. Such projects have proved that Jutson’s move from racing sailboats to power catamarans was not only financially sound, but one that opened new doors intellectually as well. Scott Jutson, 275 West 18th Ave., Vancouver, BC, Canada V5Y 2A8, tel. 604–760–2549, fax 866–459–9965, websites www.powercatamaran.ca and www.jutson.ca. Edensaw is celebrating its 30th anniversary in business. No mean feat. 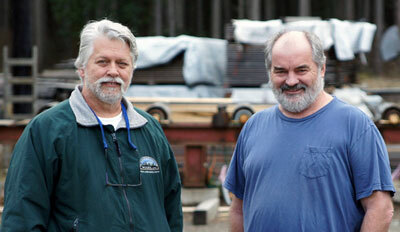 Charley Moore (left) and Jim Ferris founded Edensaw in 1984 when they drove to Gulfport, Mississippi, to buy lumber needed for a boatbuilding project; on their return to the Olympic Peninsula they sold the wood, and the business was on its way. Last we looked in on the Port Townsend, Washington, purveyor of plywood, hardwood, and tools (Professional BoatBuilder No. 135, page 8), the company was well ensconced in its new 40,000-sq-ft (3,717m2) warehouse and office building. Finished in 2005, it was the latest in a succession of expansions that reflect a solid, well-managed niche business. That was 1984. Moore and Ferris hired their first employee, Artie Franklin, the next year, and he’s still there. So is their first truck driver, Milo. A timeline of landmark moments can be found on the company website. They’ve continued to add staff as well as more space (65,000 sq ft/6,045m2) for products, tools (for a woodworker a visit to the showroom is like being a kid in a candy store), and some extraordinarily exotic woods popular with the interior designers of megayachts: anegre, ebony gaboon, iroko, bubinga, makore, padouk, purple heart…a walk through the warehouse is enough to make one weep for the beauty and aroma. A family visit to Edensaw isn’t going to thrill the kids quite like Disneyland, but for you it will be unforgettable. Edensaw, 211 Seton Rd., Port Townsend, WA 98368 USA, tel. 800–745–3336, website www.edensaw.com. An e-mail asking for advice arrived from a writer and sailor named Michael Robertson, owner of a 1978 Fuji that he and his wife are sailing from the West Coast to the South Pacific. The boat was designed by Sparkman & Stephens and built in Japan. When the owner of this Fuji 40 (12.2m) sailboat grew concerned about water weeping from the rudder, he cut out a section to investigate. He was surprised to find no metal, only foam and some epoxy. “We hauled Del Viento here in Guaymas, Mexico. On previous haulouts our rudder has dripped for days. Determined to learn whether there is any damage inside—and to learn about the construction of our rudder in general—I cut out a 12″ x 18″ [305mm x 457mm] panel from one side. Based on what I’d read, I expected to see wet foam surround flat bars of stainless welded to the stock and extending outward to serve as the rudder skeleton. 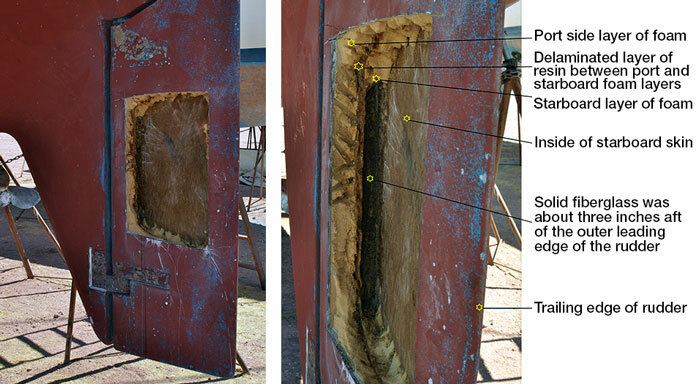 Robertson’s plan was to buy some high-density closed-cell foam and epoxy it in place of the foam he’d removed, and then cover it up by reglassing the skin. This he did, and as of this writing the boat has logged 200 miles without rudder failure. All good questions? Any thoughts, dear readers? 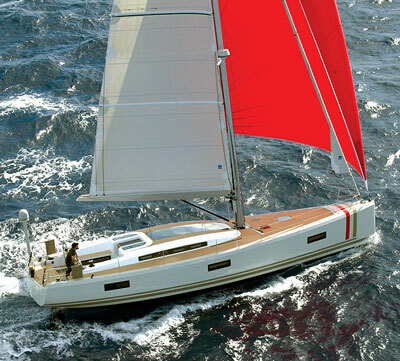 It was pricey, so for customers somewhat less hedon­istic, the company recently announced two lesser-priced versions: one with a vacuum-infused fiberglass/PVC/epoxy resin laminate for $898,000 (€659,000) without sails, and the “Essential” offshore model with carbon reinforcements in “the most exposed areas,” plus sails, electronics, and a carbon mast. Price: $1,150,000 (€844,000). All are designed by Emanuele Rossi Yacht Design (Ventimiglia, Italy). Aureus employs 52 staff working in composites, cabinetmaking, upholstery (leather is standard on the Absolute), and has an oven for post-curing carbon/epoxy parts. Owners may choose between teak or synthetic decks, or neither. Regarding style, one of Aureus’s missions is “to bring a contemporary urban look to life at sea—out with the decorative excesses of yesterday.” The interior was designed by Eric Benqué, a graduate of the École Nationale Supérieure de Création Industrielle (Paris, France) with a strong interest in furniture and interiors. In keeping with the modernist philosophy of simplicity, the carbon rig incorporates a self-tending jib with electric furling; larger headsails are still important to the inventory. The published polars show the Aureus XV making 8.4 knots in 25 knots of wind with an angle of 45°. The yard was once owned by Poncin (see “The Poncin Experiment,” PBB No. 115), and also builds the Catana 42 (12.8m) multihull along with the Catana Shipyard. It has no dealers. A project manager and a sales representative from the factory are assigned to each customer. On delivery, they along with systems technicians spend a week with the new owner sailing around La Rochelle, going over everything from sail handling to systems to spares. Judging from the company’s website, they would like the customer experience to be like buying a Rolls Royce. Basic specifications: LOA 49.31′ (15.03m), LWL 45.2′ (13.78m), beam 15.35′ (4.68m), draft 8.53′ or 9.67′ (2.6m or 2.95m), displacement 29,762 lbs (13,500 kg), sail area 1,335 sq ft (124m2). AP Yacht Conception, ZI la Penissiere, RN 137 17230 Marans, France, tel. +33 (0) 5 46 00 87 70, website www.aureus-yachts.com. The Nest Protect smoke and CO detector can be installed on a boat to alert the owner miles away, via a message on his smartphone of a dangerous condition. The sensor (top) is mounted on an overhead surface. Fire is an ever-present danger aboard any boat—occupied or unattended. But how is one, especially in the latter case, to know if a fire has started or is in the early stages of starting? Central station systems with a cellular interlink are options, but they are costly. As an alternative, one of my recommendations has been to install wirelessly interconnected smoke alarms, with one in a sheltered weather-deck area where it can be heard outside the vessel. While imperfect, it might still alert neighbors in a crowded marina. I recently saw a new product, Nest Protect, that I believe holds promise for alerting an owner or operator to a fire aboard his or her unattended boat. 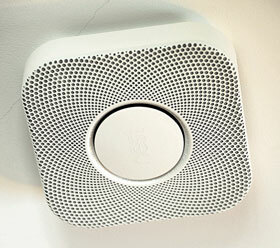 I purchased and installed two Nest smoke/CO alarms for my own evaluation. While at $99 they aren’t inexpensive, they have a variety of desirable features. Installation and Wi-Fi setup with the Apple or Droid app is fairly easy, and once set up the units are interlinked. This contradicts Consumer Reports magazine, which described the process as “an exercise in frustration.” (Setup may have been updated since that was written; Nest’s parent company is owned by Google, so one would expect easy online setup.) I downloaded the app on a Droid phone and an iPad, and both work well and are easy to use. Mine are communicating with different routers in different buildings. The app tells you the condition of each detector, if it’s operating correctly and online, the battery condition, and the last time it was updated and tested. 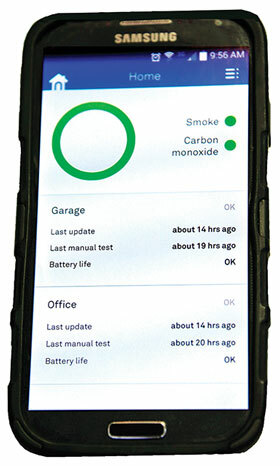 The talking feature for alarms and other conditions provides an initial heads-up if smoke or CO levels are detected, before sounding the full-blown alarm, as well as letting you know it’s successfully connected to the Internet. On the light ring on the unit’s face, different colors alert users to different conditions: green “All is OK”; red “A dangerous situation exists.” A nightlight feature lights up when you walk under it. Every first-generation product is bound to have some flaws, and Nest is no exception. The app must be running for you to receive the alert via the app, not e-mail as I would have expected. This means only those with the app linked to your account receive the alert, rather than a list of e-mail addresses you could input for family members, slip neighbors, and others. Finally, the installation manual typeface is ridiculously small. I’d like to see an e-mail-reporting feature. But, if the vessel or the marina where it’s stored has Wi-Fi, this product offers boat owners a less costly option for being alerted to a potential catastrophe in the making. Nest, 900 Hansen Way, Palto Alto, CA 94304 USA, website www.nest.com. The Threadsize Calculator smartphone app quickly tells you what size pilot hole to drill for a given tap. Machinists know that when making a screw thread with a tap, selecting the correct bit for the pre-drill hole is critical. According to cutting tool specialist Dormer Tools, differences in types and standards of available taps make it difficult even to rely on calculation formulas. To simplify the calculation, the company developed the Threadsize Calculator app, available online via iTunes (and you thought it was just for music!). Here’s proof once again that any job is easy with the right tool. 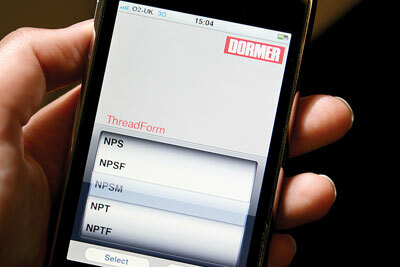 In this case, the Dormer Threadsize Calculator makes sure you’re using the right tool. And the app is free. Dormer Tools, 2511 Technology Dr., Suite #113, Elgin, IL 60012 USA; tel. 847–783–5700, website www.dormer­tools.com. Forespar introduced its new T-150 Strainer, touting its ability to mount in tight locations thanks to a simple C-shaped clamp-type bracket. The California maker and marketer of boat products began some 48 years ago with mostly rigging for sailboats, but over the years has smartly diversified into broader segments. One of the most notable is its line of Marelon (tough plastic) seacocks, through-hulls, and related plumbing fittings. Recently Fore­spar introduced the Marelon T-150 Strainer for raw-water filtration, which typically would be for engine cooling. 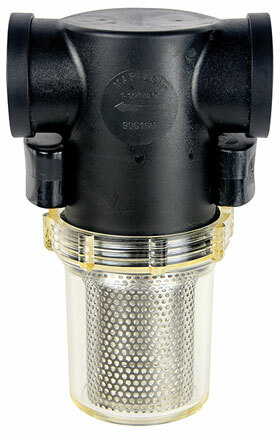 The new T-150 was designed to be somewhat smaller than other strainers on the market, and mount in tight locations, while still providing “all the benefits of traditional ‘top basket’ strainers”—including Forespar’s own MF-810 strainer. The T-150 measures 5¼″ (133mm) wide at the T, 8¼″ (210mm) tall, and 4″ (102mm) in diameter. The ports are 1½″ (38mm) NPSM parallel threads, and adapters are available for fittings from ¾″ to 1¼″ (19mm to 32mm). It’s rated at 40 gallons per minute (151 liters per minute) with #8 mesh, and pressure-tested to 150 psi. A mounting bracket is included, utilizing just two ¼″ (6mm) fasteners. The C-clamp shape enables the strainer body to snap into place and rotate to any desired direction. Any collected debris is visible through the clear polycarbonate bucket. The basket is stainless steel. Suggested retail price is $149.50. Forespar Products Corp., 22322 Gilberto, Rancho Santa Margarita, CA 92688 USA, tel. 949–858–8820, fax 949–858–0505, website www.forespar.com.